Thank you. I had a week off from work and didn’t do a thing on this. Now I’m back home and must get back at it. Back again. Normal life and other projects took me away from this for a while. 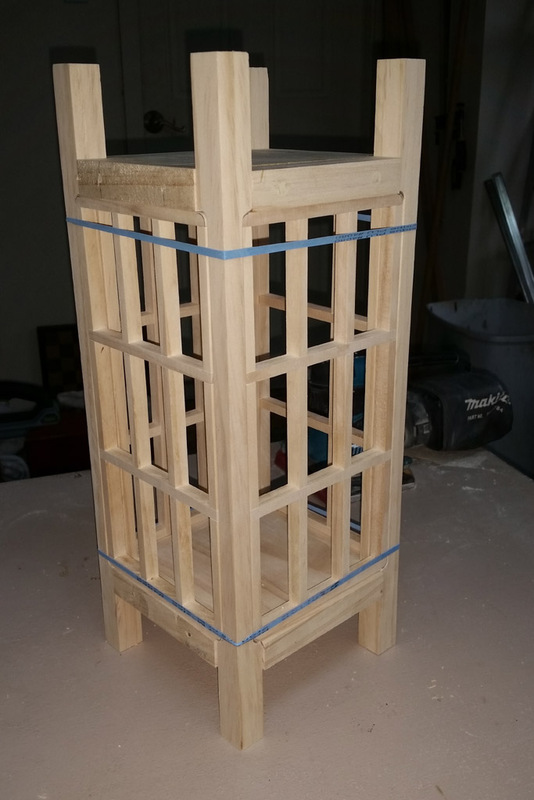 Once the glue was dried on the screen frames they were sanded. 150 grit and then 220 grit. Now they are smooth and more or less all the same size. Here are a couple of photos showing them. Pardon the dust. So those 4 pieces, called screen frames will have the shoji paper glued to one side after they are stained and clear coated. 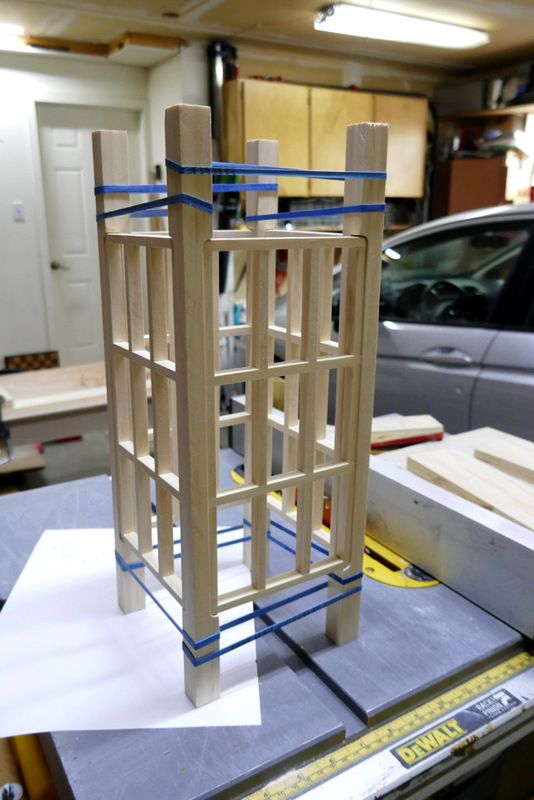 The frames will be mounted into a skelteton, or framewoork, that will hold the four screens in a box-like configuration. There are 4 corner “posts” or stiles. 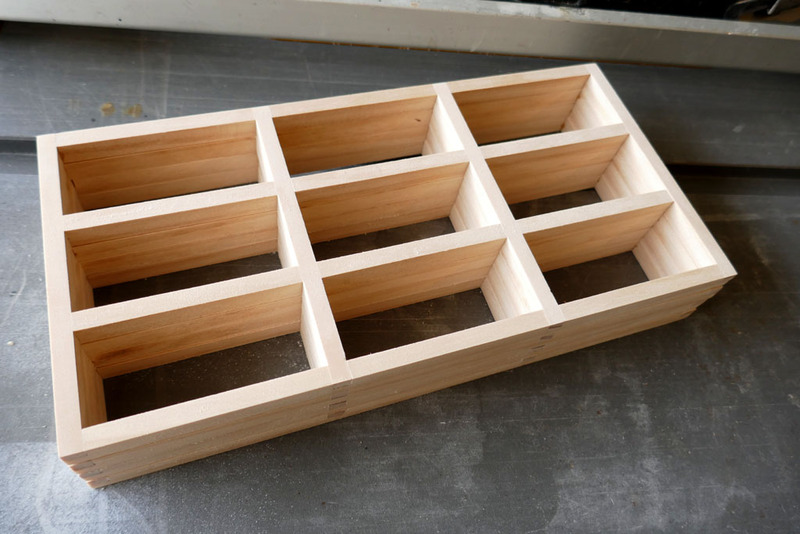 Each is 3/4 × 3/4 inch and about 15 inches long, also select grade pine. I cut them to length a few weeks back. 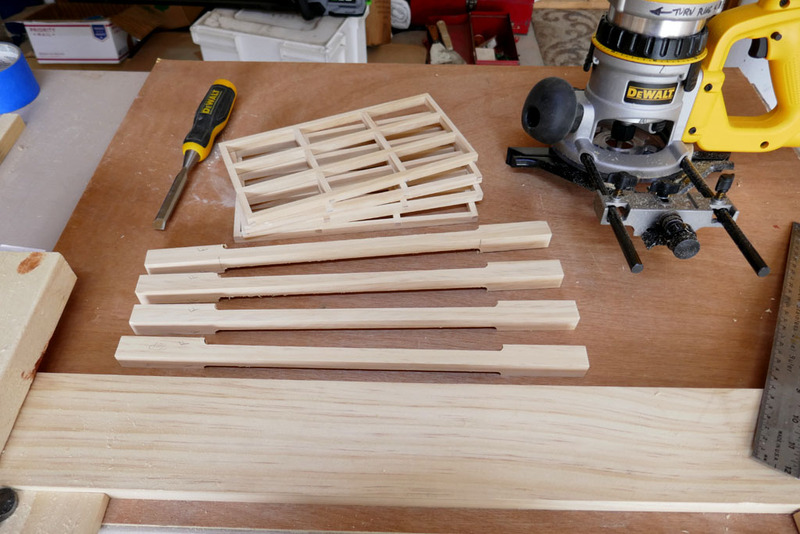 Today I started in working on them and had progressed to the stage beyond before I remembered I had not taken photos of the rough cut sticks. So we will jump to what I spent most of today on. I’ll try to show and explain how the rabbets were cut in the stiles. To mount the screens the each stile needs two rabbets cut into them. A rabbet is a sort of a notch. I used a router to cut the material away. 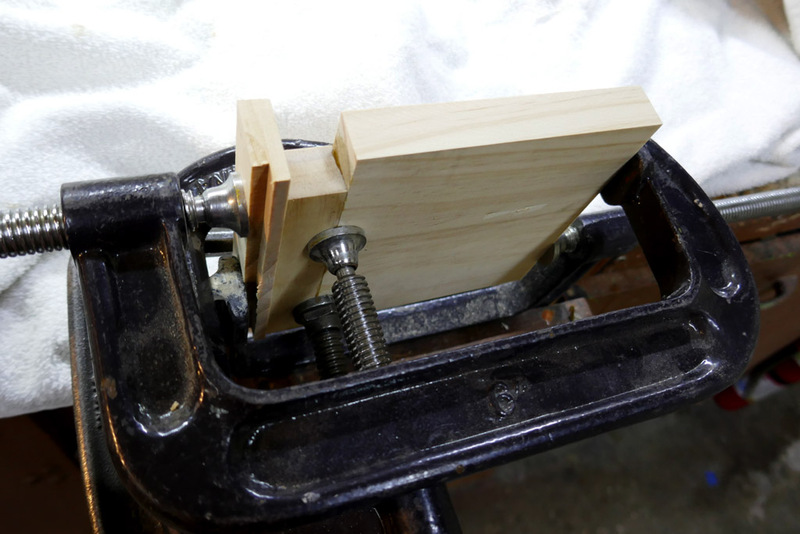 A jig was temporarily assembled utilizing wood pieces and clamps. In the photo, the 4” wide long board is the same thickness as the stile material. 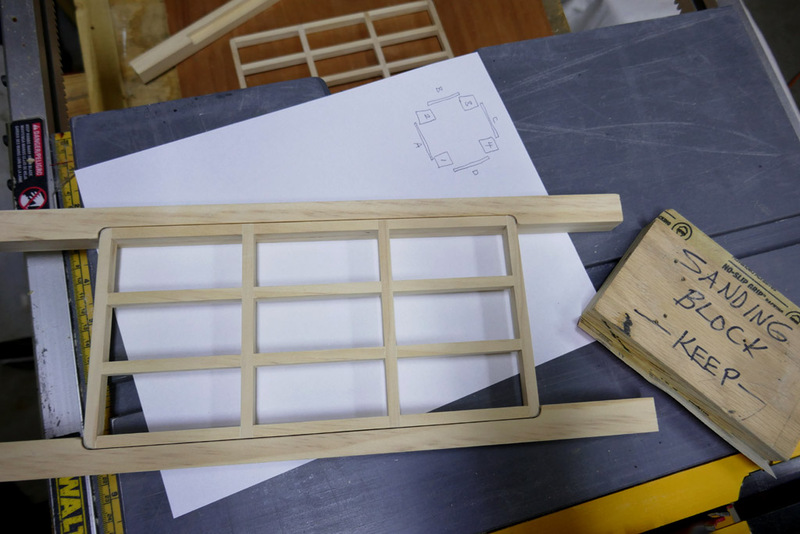 That board is to provide a base for the router to run along as well as support the stile as it is machined. In this next photo you can see two 1/2” thick scraps of wood at left and right, held down with clamps. Those are placed to stop the router at the furthest left and furthest right along the stile. The short 3/4 × 3/4 blocks were cut to locate the stile the proper distance from the ends. Some measuring, math and lots of trial and error on trial sticks was needed to get everything sized. The next shot shows a stile held in the jig. It has a rabbet cut. Each stile has two rabbets cut intothem. This next shot is a closeup of the left end of the jigged parts. The piece with a #2 in a circle is the 3/4×3/4 spacers block. 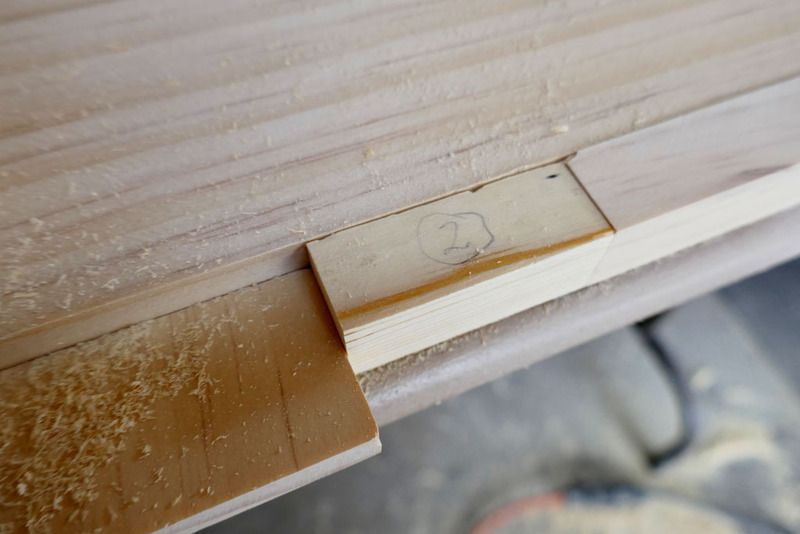 The thinner but wider piece just to the left of it is the router stop strip that is clamped down to the table. The strip of wood that disappears off to the right is a portion of a stile. Hope that all makes sense. Next, is a photo attempt to show the router fence at the stop block. My photography is not the best, but maybe it helps understand the process. 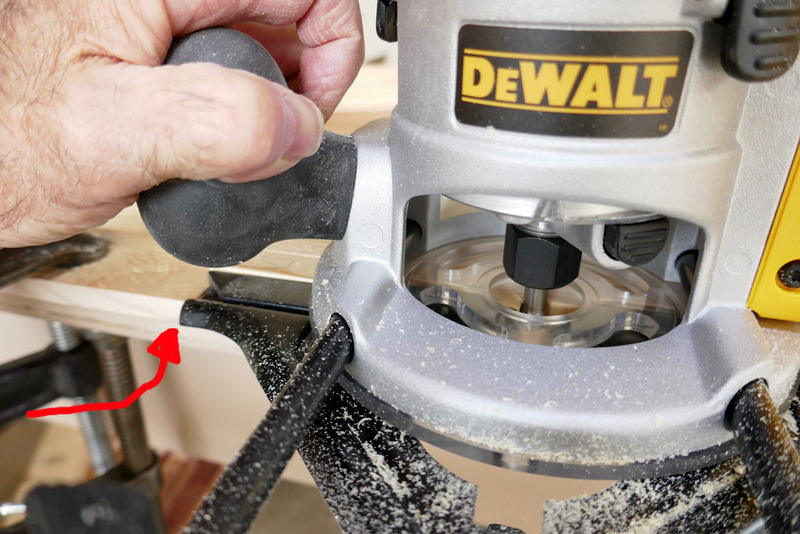 The red arrow points to where the black router fence is stopped from traveling any further left by the clamped down wood strip. That area is not in sharp focus unfortunately. And to finish off todays work here is a shot that includes the 4 screen frames and the 4 stiles. Next I need to clean up the rabbets and check the fit of the frames into the rabbets. 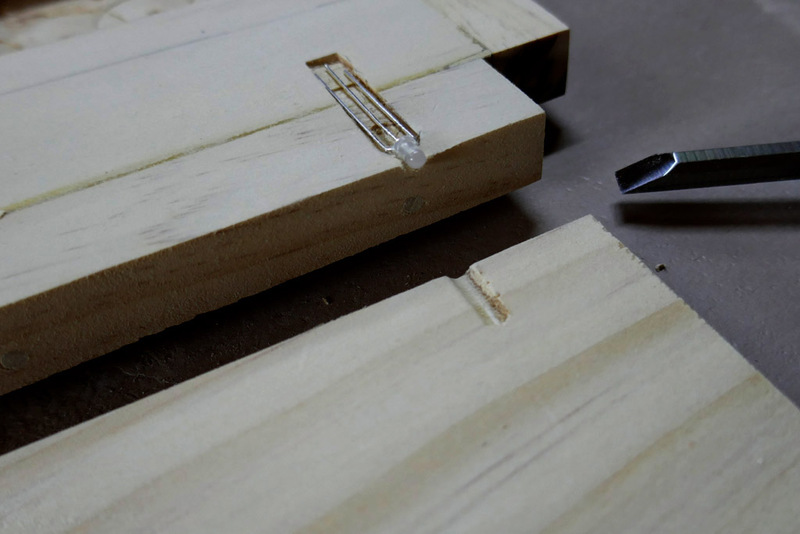 The router fence has a fine thread machine screw that allows adjustment in small precise amounts. Getting closer to the finish MD. Its looking real nice. 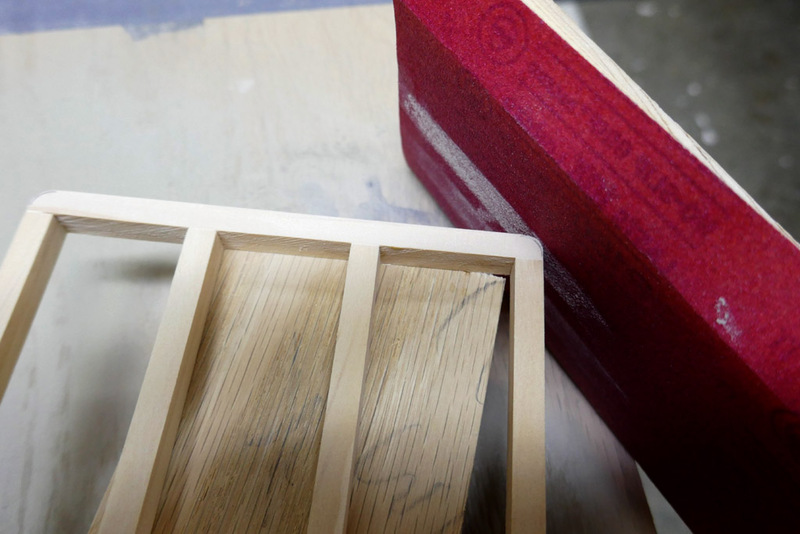 What color stain are you going to do on the frames? I have not decided 100% yet. Either ebony (black) or a rust color. The bookshelving (and kitchen cabinets) I did a year ago is ebony with the same shoji paper in the bookshelving sliding shoji doors, as this lantern will get. The rust color is what we used on the hardwood (home) doors. 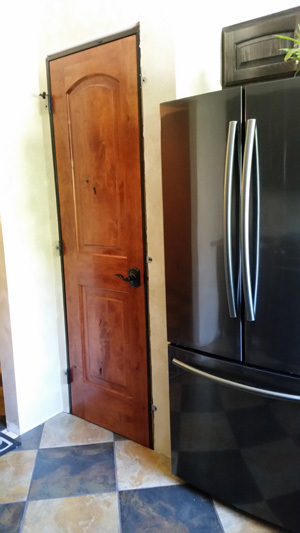 Not to derail the topic, but hardwood doors… man, don’t seem to see too many of those going in. They do have a great feel though! Back on topic… I like the rust color, but the contrast of the ebony against the shoji paper looked really nice on that bookshelf. Thanks very much. That picture does not yet have the ebony stained oak trim around the door. The door is knotty alder, left with the knots as they fall with no attempt to hide or fill them. It’s our son’s place. I’m his contractor who works for something to do and food. Next spring summer we plan on the next level up, 5 more doors like that and a bathroom renovation. If I stain this one rust, I plan to keep it and then maybe make another to be done in ebony stain and give it to our son. Aha! Then I change my vote back to Rust color. 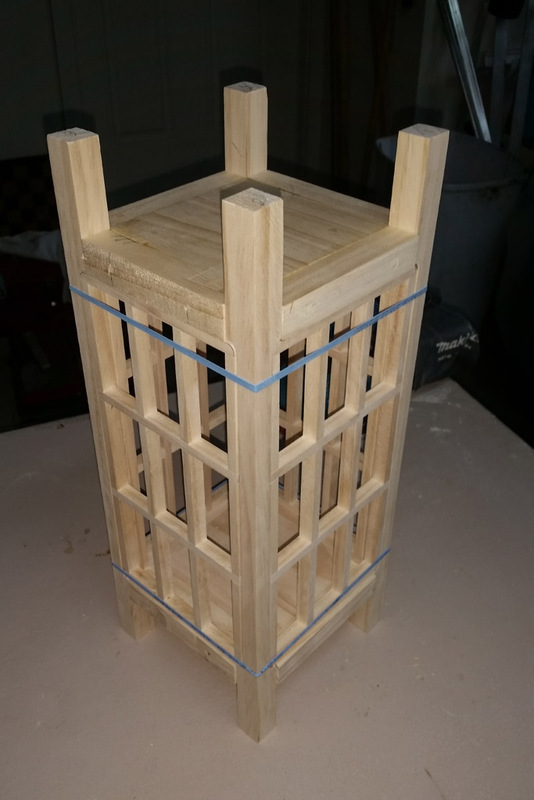 My original plan was to use a chisel to cut the round ends to the rabbet cuts to a square shape that would allow the screen frames to fit into the stiles. However, I changed my mind and decided to sand the screen frame corners round to match the rounded rabbet cut ends. That’s 150 grit sandpaper. 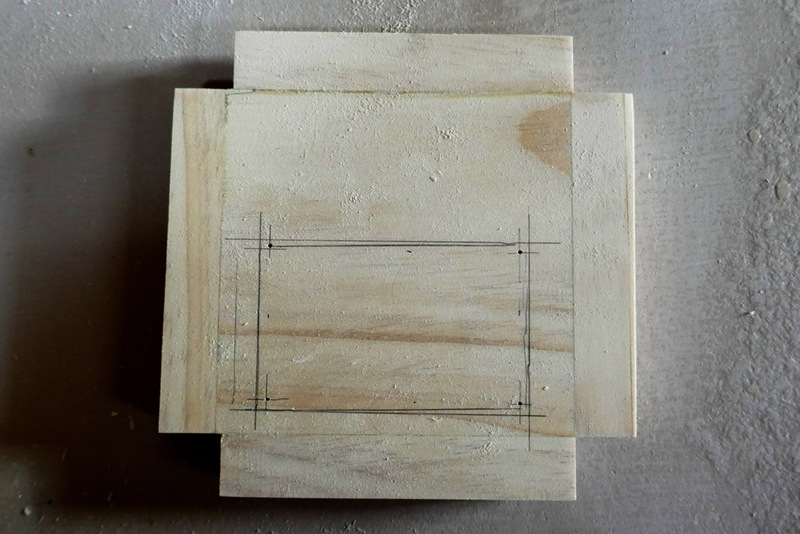 I used a block under the frame to be sanded to raise it off the worktable. I used a few different blocks to vary the height from poiece to piece to adjust where the work piece was on the sandpaper. 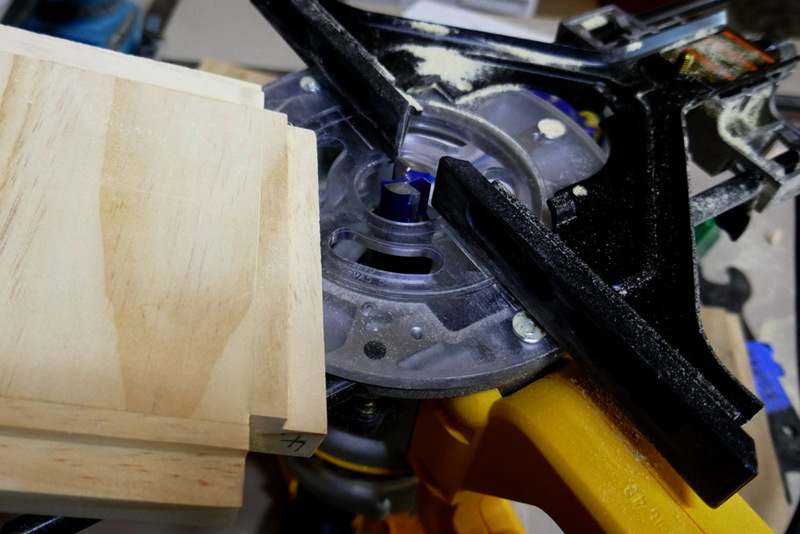 The scribe lines were made using a scrap of aluminum with a 3/8” hole drilled… same size as the router bit used on the stiles. 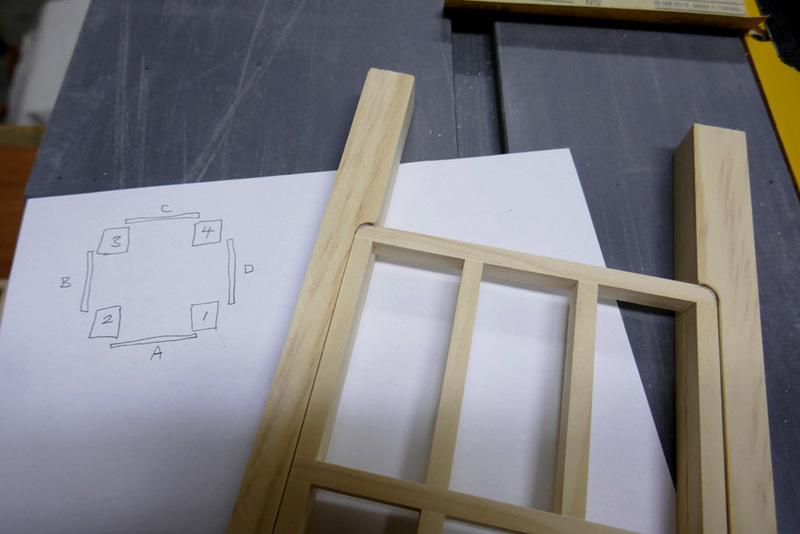 In theory each stile and each frame should be pretty much identical in dimensions. However, in practise that does not always follow. So I have assigned a letter or number ID to each piece, made a map and will follow that pattern. Here’s an idea of what this will look like. It was slightly tricky rubber banding this together with only two hands. Next, I need a top and bottom. Not sure what they should be named, so I’ll just call them the top and bottom. I don’t want end grain showing so I need to cut strips to cap the end garin. 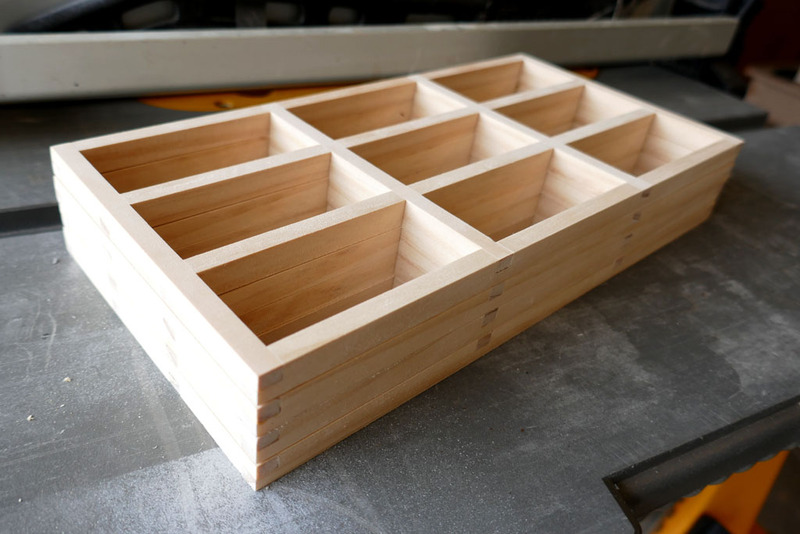 These will be glued to the main piece and I’ll use dowels to make holding them in place easier. No metal fasteners. What I mean will be clearer as work progresses. 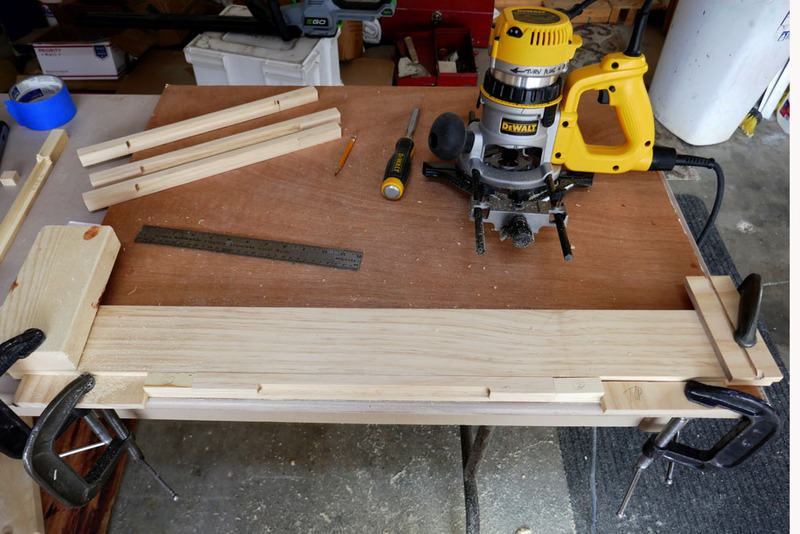 I have a jig for aligning the dowel positions and for holding the drill bit perpendicular to the edge of the pine board. It utilizes hardened steel inserts for three sizes of bits; 1/4”, 5/16“or 3/8”. It clamps and self centers. Once those holes are drilled I used a couple of steel dowel centering pins to transfer the position of the holes to the piece of wood that is to be mated. Here are the pins in place. 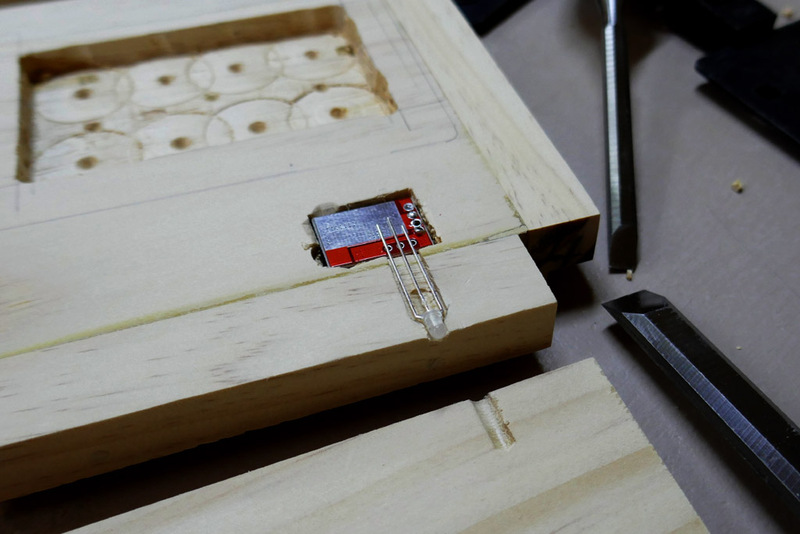 The smaller piece of wood has already been placed over the pins and tapped to allow the pin points to mark the positions. 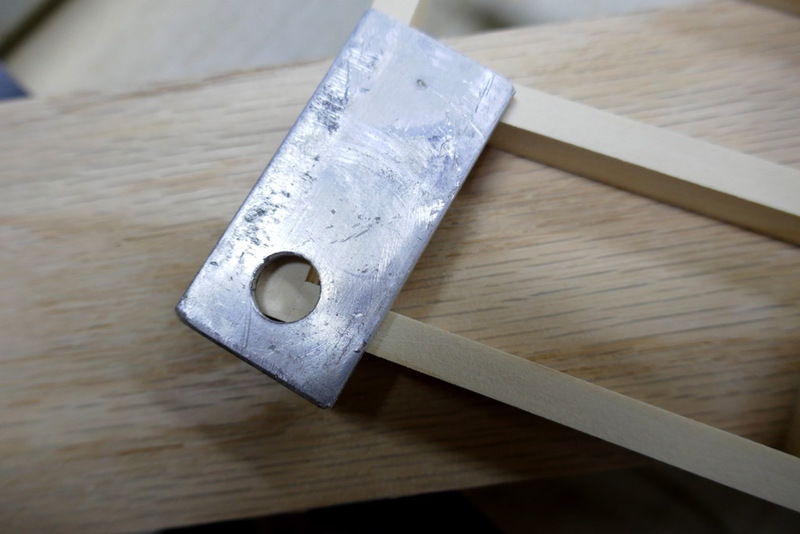 I use a couple of clamps, using a light clamping force, to hold the two pieces of wood in alignment, then tap the upper piece to contact the dowel pins. There are other ways to get the alignment, but that is what works for me. 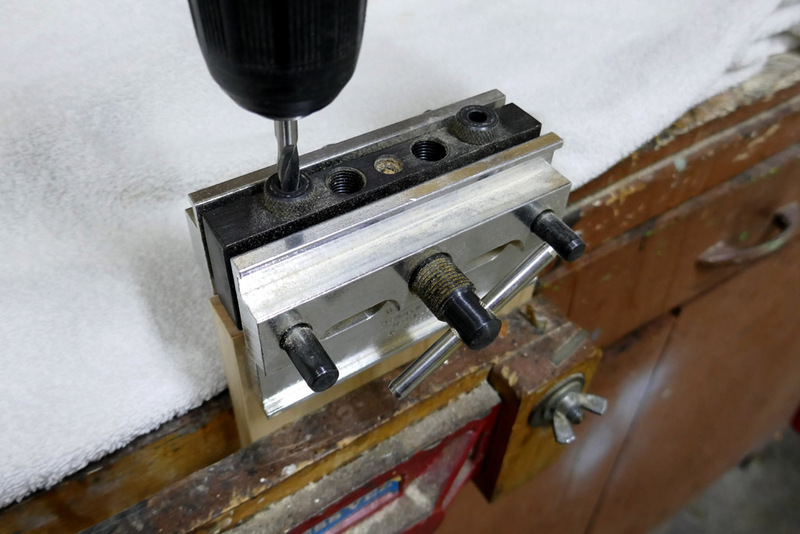 Then I drilled the small block on the drill press. 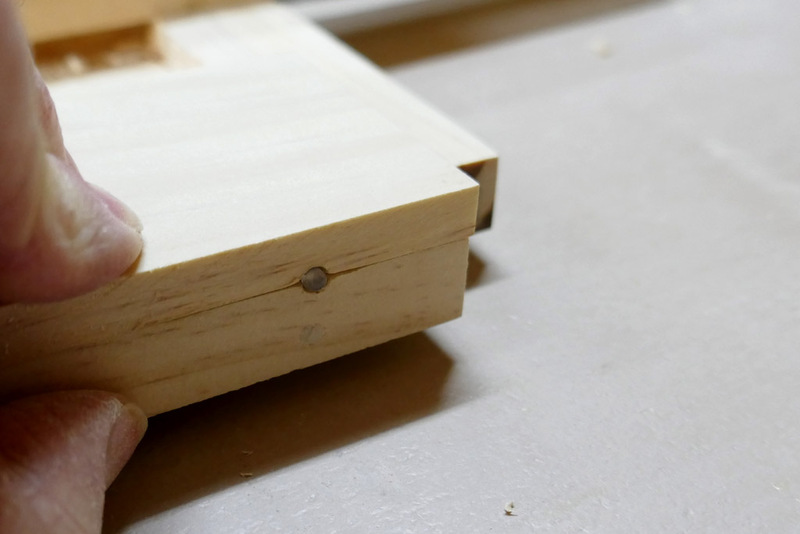 Last image for now… The small block is glued to the larger piece with assorted clamps to hold alignment. 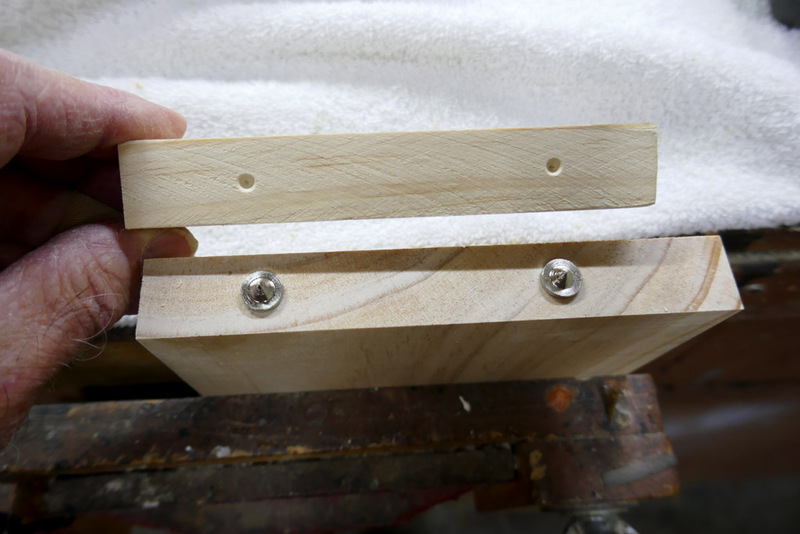 The dowel holes have just enough sloppiness to allow slight misalignment of the two pieces. The sideways clamps help with that. 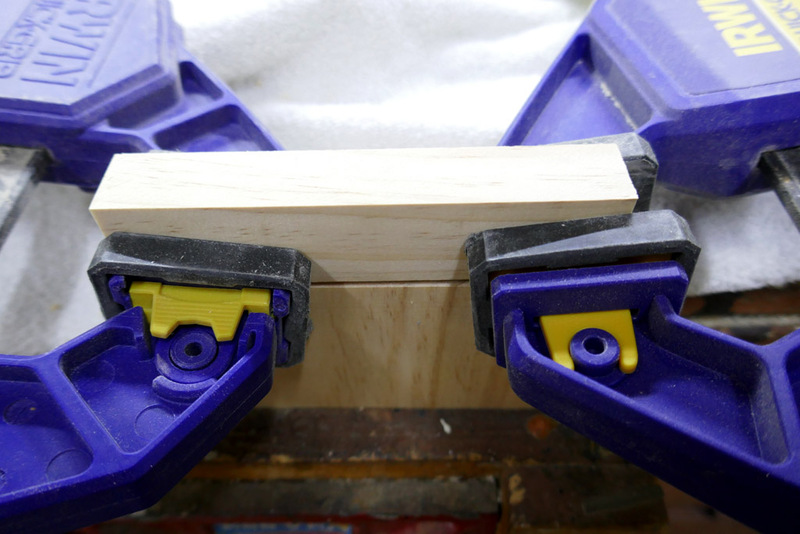 The two larger clamps provide the clamping force to make a good bond between the large and small blocks. Yep add me to the list as well. I think Don is speaking Martian. Nothing much to show today. I tested the Nichia 219C (3000K) led, Nanjg 101-AK-A1 driver, reverse clicky switch, lipo battery and charger board on the bench. The driver has a 1.4 amp max output with guppydrvr firmware. Everything works. Since the lantern will be symmetrical top/bottom, it makes me think about gcharts’s flippin’ lantern idea. That’s looking great, Don. I assume you’re going to spray the finish? By the time it is finished there will be a more or less obvious up and down. Oh hi gchart! I didn’t see you there! Were you there the whole time? Oh yeah. Spray clear coat but the stain will be applied to the screen frames by laying them in a tray of stain and letting them soak for a few minutes. The main skeleton will have the stain applied by brush. The stain then gets wiped by hand. To try a clear coating with a brush would be frustrating at best. So, yes, spray; even though maybe only 25% sticks to the wood parts. This is the bottom plate, viewed from the underside. The penciled outline is for the lipo battery. 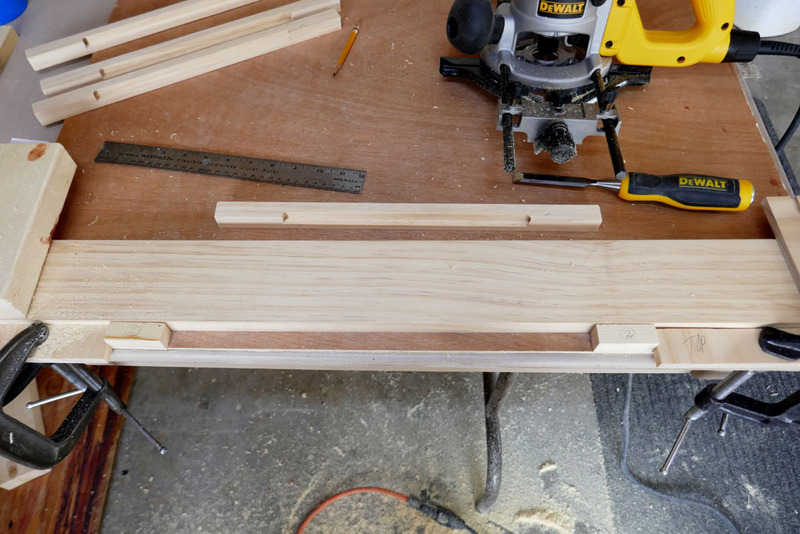 The 4 ‘pin-pricks’ are centers for the 1/4” drill bit that will set the corners. 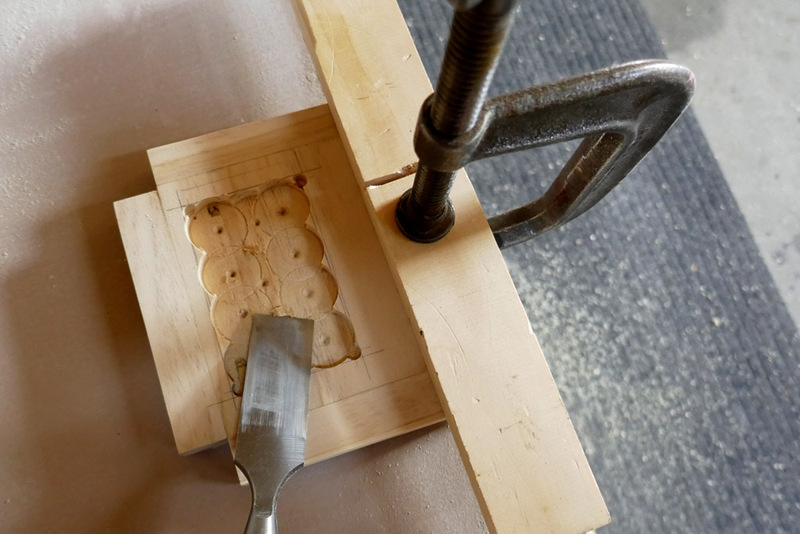 To removethe bulk of the material I used a 1” forstner bit in several places. 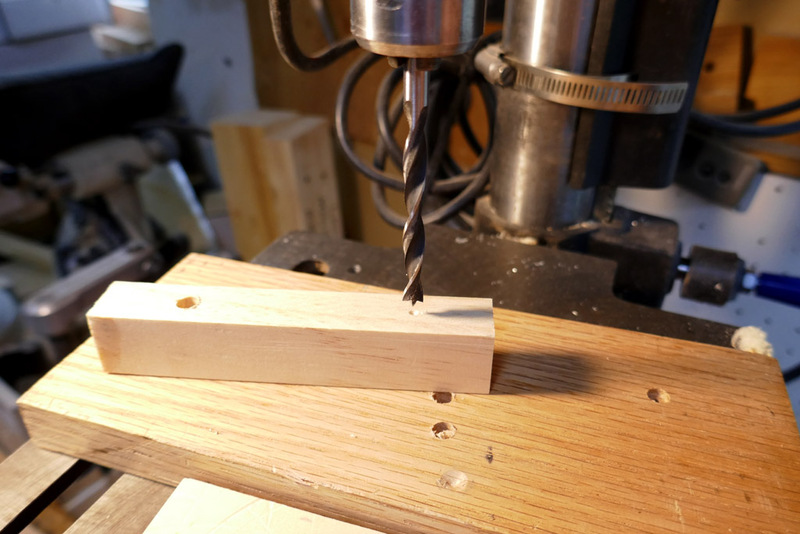 The drill press was set to drill to 1/4” deep. The edge and non drilled material was removed with a chisel. The workpiece is clamped to the table top. 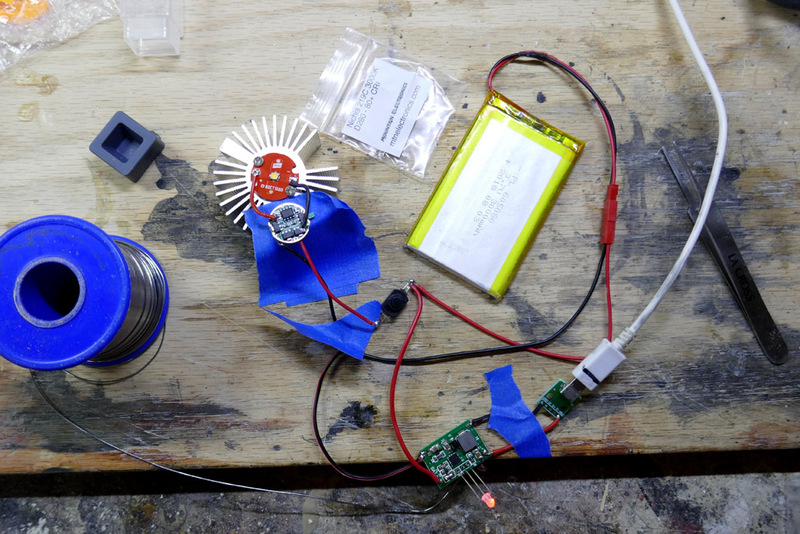 The lipo battery temporarily installed to test the fitment. This is the bottom plate temporarily installed and viewed from the underside. Here we have two pieces; the bottom plate and a “cap piece” (the thinner piece). 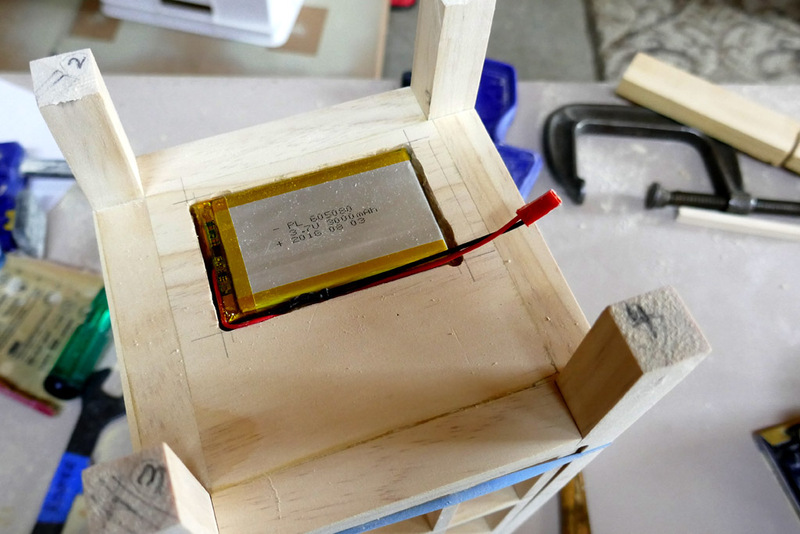 The work is being held upside down… the thinner piece will be facing down when the lantern is assembled. The thinner piece is slightly over 1/4“thick at this point. That is the two color led that indicates what stage the charger is in. There will be two of these thinner“cap pieces” on the bottom. The smaller will be more or less permanently secured over the led and charger while the larger cap will be the battery cover. The led is fitted into a recess drilled and chiseled out of the bottom plate. The charger board is set into another recess. There willbe additional slots cut to route the wiring through. That is only a 1 amp charger. There will be a small heat sink that protrudes through the bottom cap piece. I have yet to decide which heat sink I’ll be using. For those not familiar with woodworking this is the router with bit and fence that was used to cut a “rabbet” out of the edge of both the top and bottom plates. What this cut out is for will become readily apparent in a future photo. 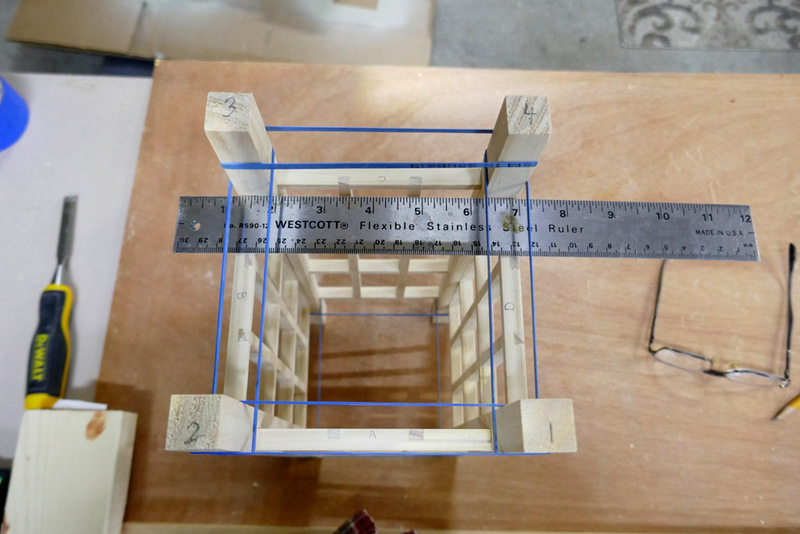 The fence sets the width of the rabbet to 7/16” and the router base height is set to limit the depth of the cut to just under 1/4”. The photo is just for illustration. In use the work piece is flipped over with the edge where the rbbet is against the black router fence. 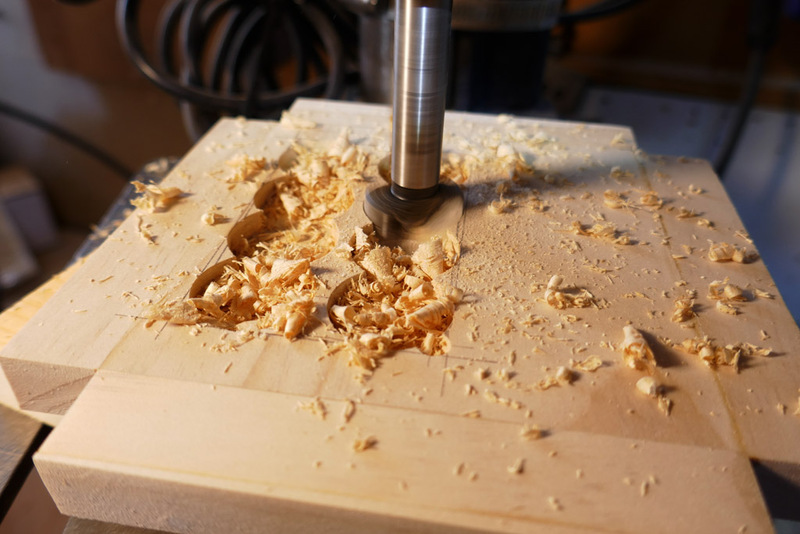 And the router and work is flipped over, the work piece clamped to the table with the router moving left to right along the edge. Looking good MD. the lantern that is. A little more work to end the day…. The plan is to have a voltmeter located in that bottom plate edge, alongside the charger indicator led. In the next image I am carving the notch for the meter. It is one of those 3 digit led meters. 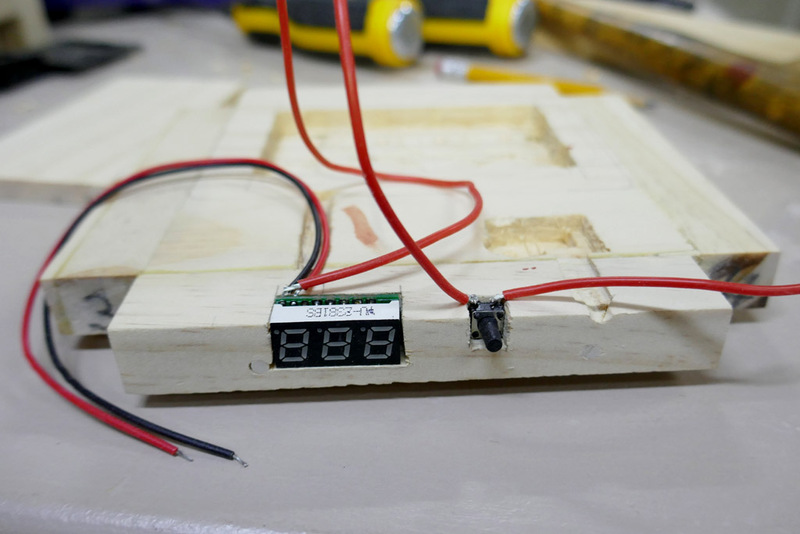 The voltmeter is to be wired into the battery with a normally open momentary contact push button switch. Press the button to get a voltage reading. The switch was scavenged from some old board from something that was junk. The red smudge on the wood is my blood. I inadvertently (gently) touched the chisel blade with my finger tip… I keep my chisels sharp. There is one more cutout to be made. The small board that mounts the micr usb inlet port for the charger will be located on the bottom plate edge around the corner from the led indicator. I hope to get that dome tomorrow. The bottom plate board is upside down on the bench. The digital meter decimal points are located at the lower edge of the display when viewed correctly.